Injecting mood into a landscape painting not only makes the overall effect much more exciting, but can create a strong sense of space and distance in the work. 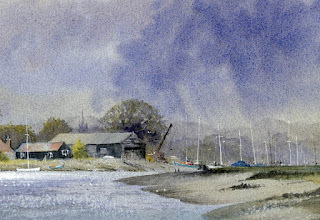 Although this scene of Faversham Creek in Kent already had a feeling of great space I wanted to exaggerate the atmosphere even more in the finished painting. I chose a blue-grey tinted paper for this watercolour and deliberately kept the distant wooded hillsides very faint in order to create a striking contrast with the foreground features. The strong tones on and around the buildings help to push the faint hills well into the background. If everything is given the same degree of tonal strength then it will be hard to distinguish various features from each other, even with contrasting colours. Masts, gulls and some white boats were rendered in white gouache, and I have only included the main part of the composition so that the distant hills can be seen better. 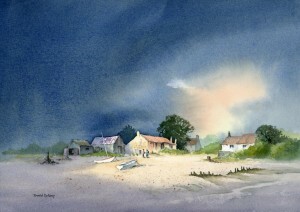 I shall be giving another of my annual seminars at the Settlement, Pontypool on Saturday 1st October, and it will be covering how to create mood and drama in a painting, beginning with a watercolour demonstration, and this will be followed by an illustrated talk on the subject, including a great many examples of different landscapes and coastal scenes. 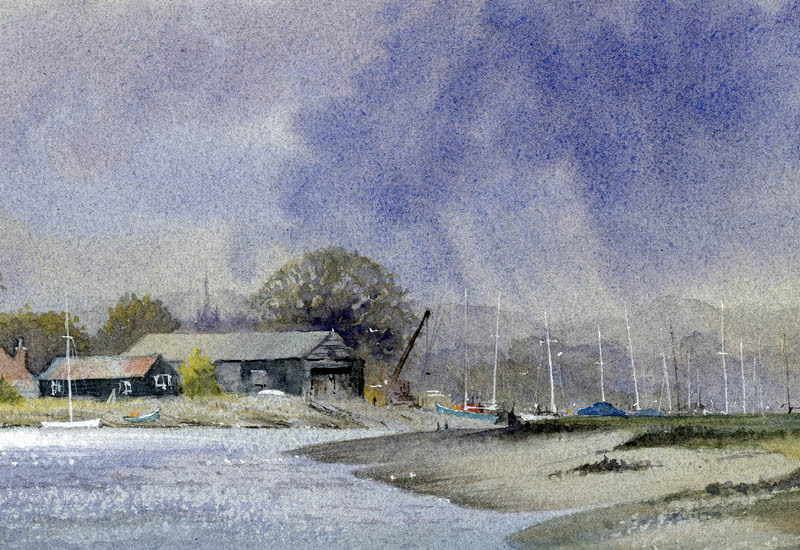 You can find details on my website http://www.davidbellamy.co.uk/seminar-pontypool-october-2016/ I shall be demonstrating the exciting Daniel Smith watercolours and Saunders Waterford paper, and there will be plenty of time for you to ask any questions, so I hope to see you there. Many newcomers to painting find the terms ‘tone’ and ‘value’ confusing: what is their significance and how do they relate to colour? The two terms actually mean the same thing in painting, that is, the degree of darkness or lightness of a colour. With indigo, for example, you can obtain a very dark tone by not adding too much water, but when you reduce its intensity with water you will achieve a lighter tone, and thus it is possible to create a wide range of tones. In comparison, however, a lemon yellow will have a much smaller range of tones because it is a far lighter colour. 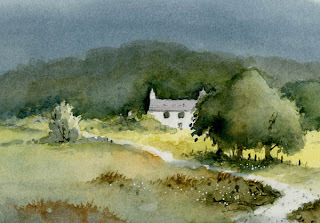 In this extremely simple watercolour you can see how tones have been used effectively to highlight the cottage by describing its outline with a mass of dark green tone behind it. The roof is a mid-tone which sits well between the white wall and dark background. The pathway remains light in tone, though slightly darker under the trees where it is caught in shadow, and it is defined by making the adjacent ground darker. This darker ground ranges from quite dark in the foreground to being almost imperceptible in places. The light-toned field between cottage and foreground trees helps to show up the dark tree-trunks and fenceposts. I don’t cover tones in great depth in all my books, but my Learn to paint Watercolour Landscapes has a useful section on the subject, and signed copies can be obtained from our shop.